The talent agency "VMA – Voyez mon agent" was founded in 1974 by Bertrand de Labbey, the current president, who first launched his career by representing artists in the musical field. The agency then expanded its activity to everything related to the entertainment business: Cinema, Theater, Television, Music, Internet, commercial deals, production of shows, representation of talent companies for their activities of record producers and music publishers. The agents, Béatrice Hall, Bertrand de Labbey and Ivan de Labbey represent numerous artists in all areas of entertainment (actors, writers, directors, stage directors, composers…). The caricature on the right, inspired by the movie “The Bear” by Jean-Jacques Annaud, released in 1988, was drawn by Wolinski. 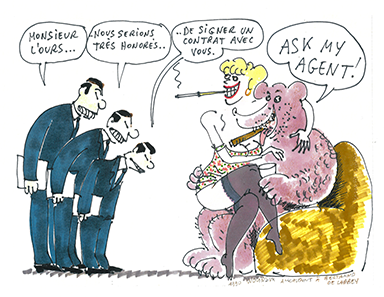 This drawing gave Bertrand de Labbey the idea to change the name of Artmedia Variété to Voyez Mon Agent (which means “Ask my agent”). On that occasion, Wolinski signed his work for Bertrand de Labbey. VMA provides its talents with a studio for international castings.